an asterisk (*) indicates full text is available free of charge on this or another site. For those not available, email me! Jackson, M., Belton, P., McMahon, S., Hart, M., McCann, S., Azevedo, D., and Hurteau, L. (2015). The first record of Aedes (Hulecoeteomyia) japonicus (Diptera: Culicidae) and its establishment in Western Canada. Journal of Medical Entomology 53(1): 241-244. Scott, C., Kirk, D., McCann, S., & Gries, G. (2015). Web reduction by courting male black widows renders pheromone-emitting females’ webs less attractive to rival males. Animal Behaviour 107: 71-78. *McCann, S., & Belton, P. (2014). A new record of Culex restuans Theobald (Diptera: Culicidae) in British Columbia. Journal of the Entomological Society of British Columbia, 13-14. McCann, S., Scott, C., Jones, T., Moeri, O., O’Donnell, S., & Gries, G. (2014) Red-throated Caracara, a falconid raptor, rivals predatory impact of army ants on social wasps. Insectes Sociaux, 1-8. *Bennett, R. E., Zuniga, I., Bonta, M., Anderson, D. L., McCann, S., & Herrera, L. (2014). First Nest Record of Red-throated Caracara (Ibycter americanus) for Middle America. The Wilson Journal of Ornithology, 126(2), 389-392. *Hrabar, M., Danci, A., McCann, S., Schaefer, P. W., and Gries, G. (2014). New findings on life history traits of Xenos peckii (Strepsiptera:Xenidae). The Canadian Entomologist. 1–14. *McCann, S.., Moeri, O., Jones, T., Scott, C., Khaskin, G., Gries, R., O’Donnell, S., and Gries, G. (2013). Strike Fast, Strike Hard: The Red-Throated Caracara Exploits Absconding Behavior of Social Wasps during Nest Predation. PLOS-ONE 8:e84114. *McCann, S., Moeri, O., Jones, T., O’Donnell, S. , and Gries, G. (2010). 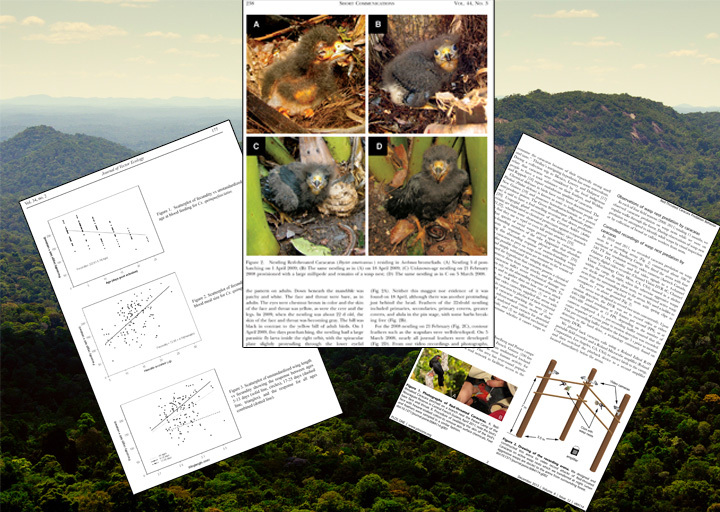 Nesting and nest-provisioning of the Red-throated Caracara (Ibycter americanus) in central French Guiana. Journal of Raptor Research 44:236–240. McCann, S., Day, J. F., Allan, S., and Lord, C. C. (2009). Age modifies the effect of body size on fecundity in Culex quinquefasciatus Say (Diptera: Culicidae). Journal of Vector Ecology 34:174 –181.